When was that last time you took a cab? What was the experience like? What should be clear from the aforementioned quotes from my anonymous friends is that one’s experience in a cab varies greatly according to external conditions (such as the unexpected presence of ketchup on the seat, the sudden absence of your sock) and internal conditions (being hamsky, experiencing a moment of pensive self-awareness). Similarly the novel: novels always point outwards — towards the social/political climate in which they are received — and inwards, insofar as they are reflective of psychological interiorities, if not of the characters then at least of the author. You are outside; you hail a cab; the driver lets you into a private and confined world and drives around for a while; you pay the fare, leave a tip, and the driver lets you out in a new, different place than you were when you started. So far so good. And if there are similarities between the experience of riding in a taxi and of reading a novel, we might extend this analogy to the role of the cabby who operates much the same as that of the novelist. To get into a cab is to accede to a tacit contract: in exchange for some money and temporary control of your body in physical space, the cabby will transport you somewhere else. In much the same way, the novelist demands some of your money and temporary control of your mind in order to transport you to another place. Both cabbies and novelists are charged with “taking us for a ride,” in other words, and in both cases this ride’s success depends on our ability to suspend our disbelief, temporarily surrender our own better judgment, and enter into an interior world that is not our own. 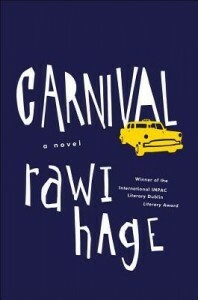 Rawi Hage’s newest novel Carnival explores the dynamics of this parallel in a way that is, if not always elucidating, pretty entertaining at least. Rambling by design, the novel reads as a series of short episodes in the life of a cabby named Fly. Hage lets Fly’s garrulous narration take us for a strange trip through an unnamed North American city during Carnival time. Although a plot does begin to coalesce as the novel progresses, the effect is less that of a conventional novel and more that of a bizarre religious text in miniature: the stories are self-sufficient, but each contributes in some way to a larger, weirder project whose nature shifts slightly with subsequent readings. As a professional nomad and life-long outsider, Fly is in many ways the perfect narrator. While many other cab drivers in Fly’s demented world set up in strategic locations waiting for customers or calls from a central dispatch (Fly calls these cabbies “spiders”), our narrator buzzes around the city in search of fares. He is our fly on the wall, driving through the city looking out for customers, constantly observing, occasionally witnessing. Almost never does he participate directly in the madness unfolding around him (although the few moments when he does are some of the book’s most enjoyable). Although his friends, enemies, and clients all provide more than enough color to keep readers engaged, Fly himself is careful to remain at a quiet remove and let the action unfold around him as he zips around. This is not to say that he is a neutral observer. In the novel’s first pages we learn that Fly is something of an eccentric free-lance intellectual, his apartment crammed with books. He writes, thinks, and speaks in a semi-delusional religious tenor, swinging from tender remembrances of his childhood to raging prophecies about the absurd society of the Carnival to onanistic reveries in which he imagines himself as hero in famous episodes in military history. We learn that Fly is the child of a trapeze artist and a flying-carpet pilot, and that he grew up amongst the freaks and performers of a traveling circus. Perhaps because he was raised by the circus’s bearded lady, Fly has a particular sympathy for the outcast, the abnormal, the downtrodden. His friends are prostitutes, paupers, and political radicals, and through Fly’s sympathetic eyes we gain access to their troubled lives. Through his narrator Fly, Hage takes the reader all over the place, veering in and out of sequences and making the occasional gratuitous left turn. If the episodes don’t add up to any particularly compelling narrative, it is at least possible to imagine how they all relate to the novel’s central themes of movement, struggle, change, and injustice. The only plot element that lasts long enough to get developed in any substantial way is a story of Fly’s radical dissident friends, who struggle fiercely against the system only to be smothered by injustice, indifference, illness, and addiction. They die in meaningless obscurity, having achieved nothing, and spoiler alert Fly flies away. It may be that this episode only seems to be the central story from which all the others digress, because it is the slowest fizzle — the most poignant anticlimax. It is hard to say for certain. Some of the detours feel like they might perhaps be autobiographical flourishes on Hage’s part; the author did spend some time driving a cab in Montreal. However, these asides neither distract from nor slow the pace of the novel’s schizophrenic momentum. This is not a fault of the novel, but simply a fact. Strangely enough, despite the power of the subject matter and the poetry of the language, Carnival’s most memorable feature is it’s factical quality. Like a cab ride, you get into it, it takes you around for a while, and you get out. The cab flies away into the night.